distribution DISTRIBUTION: Known from just a single coastal county (New Hanover), where first recorded in 2006. The species was also found in the same location in 2007 and in 2010, strongly suggesting that a local colony has been established there for at least five summer seasons. 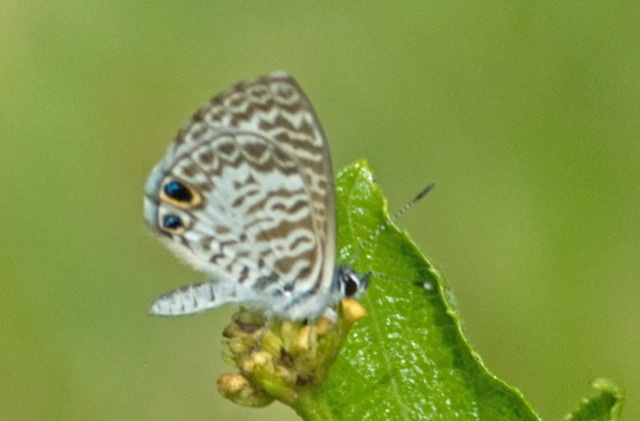 This species, essentially resident only in Florida (in the United States), has also established local breeding colonies in Charleston and Horry counties in SC and at a site in southeastern VA in 2001.
abundance ABUNDANCE: An accidental visitor to NC, where it has established a single known breeding site. It is not considered a northbound migrant, and these outposts undoubtedly were established by gravid females laying eggs on foodplants while in the local area, or by eggs/larvae/pupae already present on the foodplants when brought to nurseries and then sold to, and planted by, gardeners. New generations become established, and apparently persist for a few years. flight FLIGHT PERIOD: The records in NC are August 27, 2006; August 29, 2007; and the latter part of July 2010, all by a single observer in his yard in Wilmington. Nate Dias has noted in Charleston, SC, that "we see new emergence events from March - December. I have seen adults every month of the year except February. The larvae are tough to spot (for me anyway). Our numbers of adults peak in August-October generally." One must wonder if there is a "spring" brood at all in NC (i.e., if the life cycle at such a northern site does not "produce" adults on the wing until July or August). 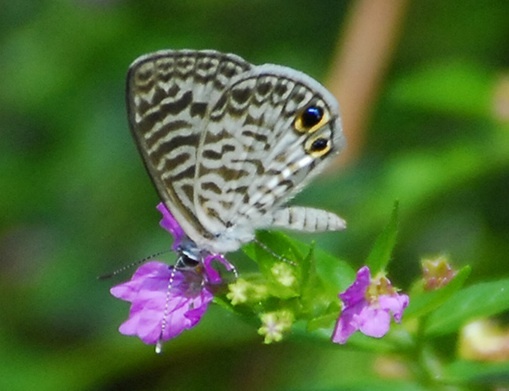 habitat HABITAT: The species has a great range of habitats in FL, but they are mostly ruderal, such that it is found in weedy lots, gardens, roadsides, forest edges, and other open or semi-open areas. In the Carolinas, the habitat is essentially yards and gardens along and near the coast, especially where larval foodplants are found. 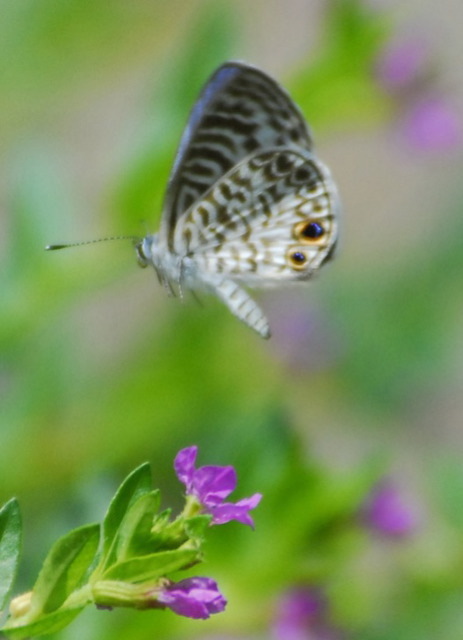 plants FOOD AND NECTAR PLANTS: Legumes are the primary foodplants in Florida. However, the most frequent foodplants in SC (if not in other parts of the range, including NC) are leadworts (Plumbago spp. ), a group of plants in the family Plumbaginaceae. Leadworts are not native to the Carolinas, but they are commonly sold at nurseries. Most colonies in SC are suspected of being started around plantings of these low evergreen shrubs, according to Nate Dias. The species is not particular in nectar plants; individuals in Wilmington nectared on Mexican heather and lantana. comments COMMENTS: We (the authors) were completely surprised when Mark Jones notified us in January 2011 that he believed he had photos of Cassius Blues taken in his Wilmington yard in recent years. Sure enough, the three photos (of two individuals) were indeed of that species, establishing a first state record. As mentioned above, the fact that all three records, at a single site over a five-summer period, were from a single yard, makes it clear that these (in 2007 and 2010) cannot simply be migrants/vagrants coming up from FL, especially as it is known that the species establishes local colonies in Charleston and at a few other sites in SC. Apparently the Wilmington colony did not survive the bitterly cold winter of 2010-2011; none were reported at all in 2011, despite some search.